The Celebrity Baby Bump: Zuma Rossdale's Too Cool Sunglasses! Zuma Rossdale's Too Cool Sunglasses! 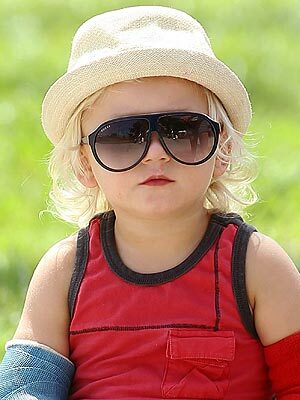 Who can resist the cuteness that is Zuma Rossdale, especially when the 2 1/2 year old tot is rockin' his new sunglasses! Zuma, cast and all, enjoyed some park play June 23 with his big brother, Kingston (5)--also a cutie in his own right! Those seriously awesome children's sunglasses Zuma is sporting come from a new Gucci collection. The pair are called the Pilot Frame ($140) in black — and they feature the design house’s adorable teddy bear logo. Yay! for celebritybabies.people, who have pointed out a similar pair of sunglasses for children that are more affordable at just $2.99-- the Aviator Sunglasses ($3) from The Children’s Place.